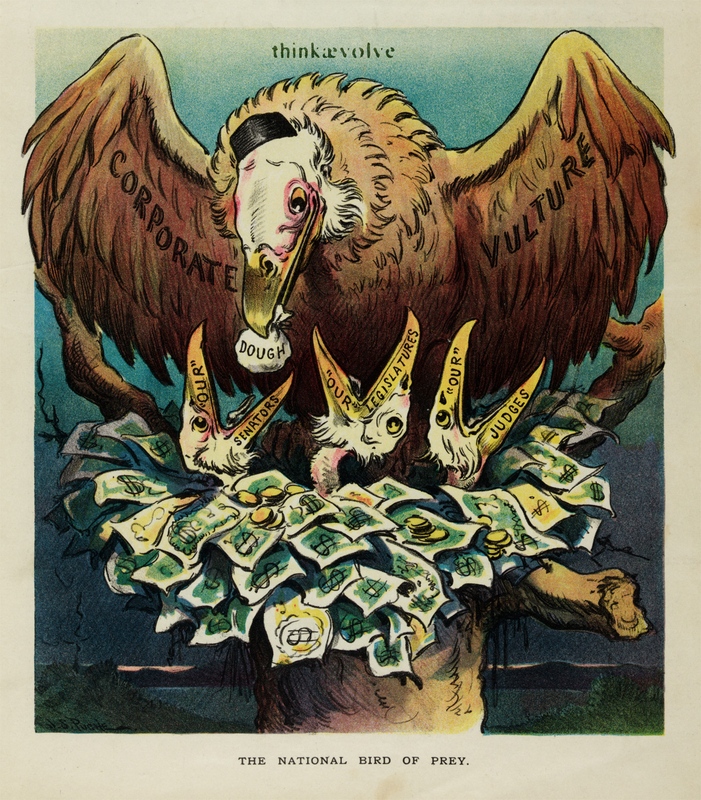 Summary: Illustration shows a large vulture labeled “Corporate Vulture”, wearing a cap usually associated with John D. Rockefeller, feeding a bag of “Dough” to a chick labeled “‘Our’ Senators”, two other chicks are labeled “‘Our’ Legislatures” and “‘Our’ Judges”; their nest is made of money. 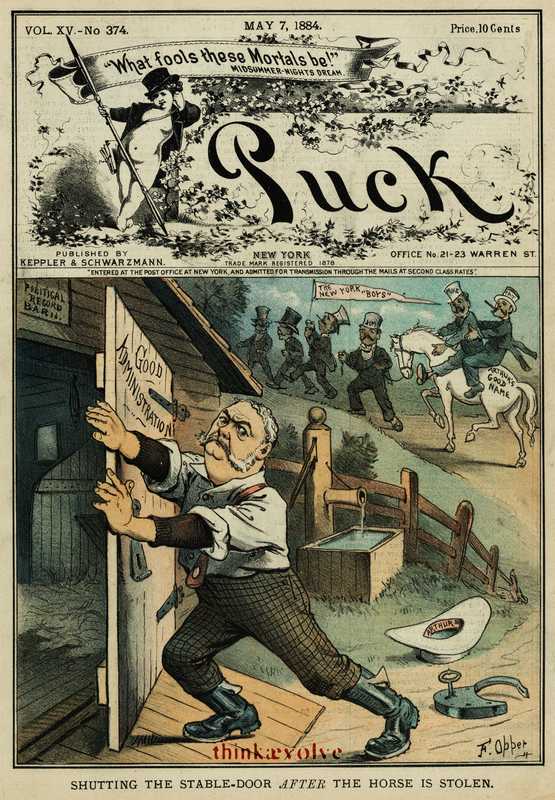 Summary: Illustration shows Chester A. Arthur closing a door labeled “Good Administration” to a stable labeled “Political Record Barn”; there is a lock on the ground with a key in it and, in the background, a group of men labeled “The New York ‘Boys'” and “Jim, Mike, [and] Pat” are getting away with a white horse labeled “Arthur’s Good Name”. 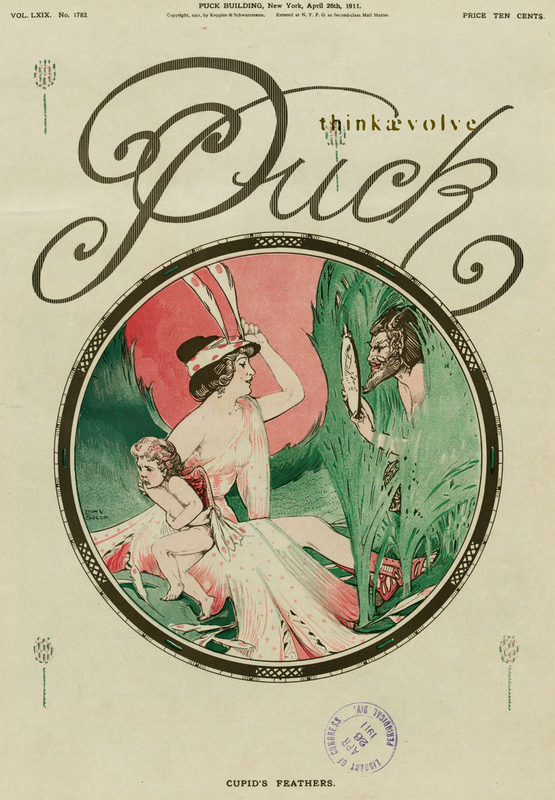 Summary: Illustration shows a woman holding Cupid in one arm and plucking and arranging its feathers in her hair, and admiring herself in a mirror held by a faun who is mostly hidden by tall grasses. 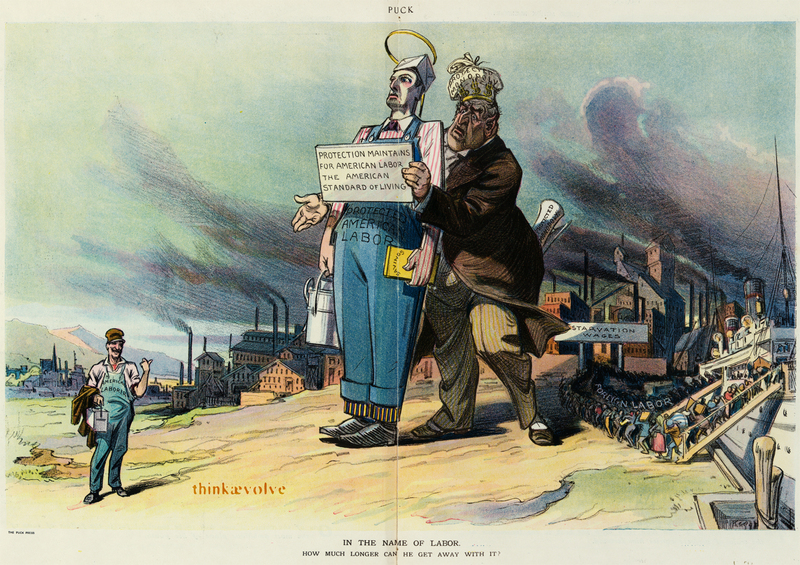 Summary: Illustration shows a gigantic man wearing a crown labeled “Protected Monopoly” holding upright a wooden figure of an American laborer labeled “Protected American Labor” and a sign that states “Protection Maintains for American Labor the American Standard of Living”; the wooden figure holds a dinner pail in one hand and a booklet labeled “Savings” in the other. A diminutive man labeled “American Laborer”, in the left foreground, looks at the viewer and gestures with his thumb back at the wooden figure. On the right, from a ship at dock, a stream of “Foreign Labor” disembarks, passing through a gate labeled “Starvation Wages”, and heading for factories in the background. Caption: How much longer can he get away with it? 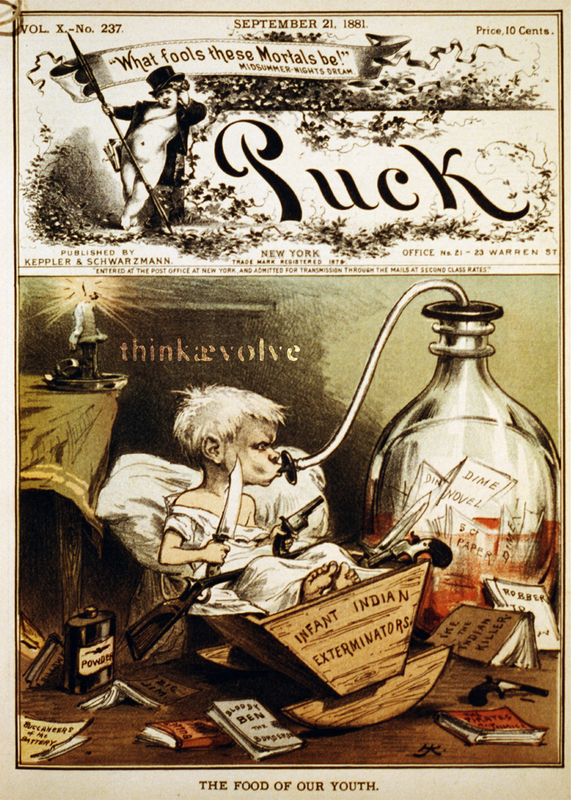 Summary: Caricature showing infant in crib with weapons surrounded by anti-Indian and violent dime novels. 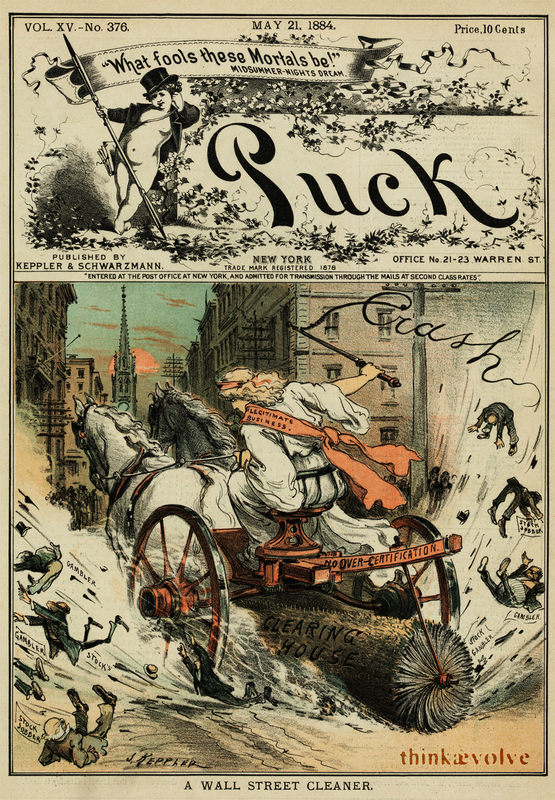 Summary: Illustration shows a woman labeled “Legitimate Business” cracking a whip that spells “Crash”, driving a two-wheeled cart drawn by two horses with a large brush labeled “No Over-Certification Clearing House” attached, sweeping Wall Street clean of men labeled “Stock Jobber” and “Stock Gambler”. 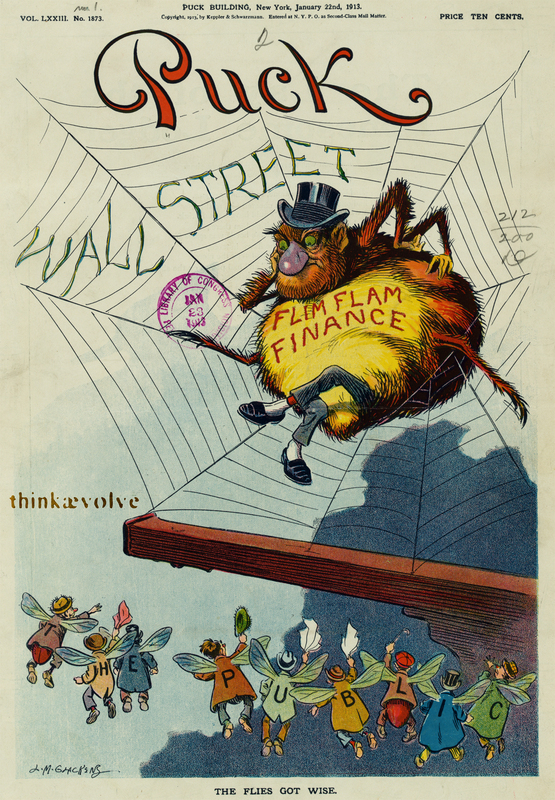 Summary: Illustration shows a large spider labeled “Flim Flam Finance” with a disgruntled look on its face, sitting on a cobweb labeled “Wall Street”, looking at a bunch of flies labeled “The Public” hovering just beyond the cobweb, mocking the spider.